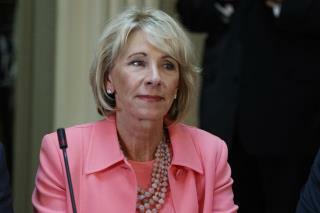 (Newser) – Consumer advocates are accusing the Education Department of caving to pressure from the student loan industry to the detriment of borrowers after Betsy DeVos rescinded two Obama administration memos Tuesday, USA Today reports. According to NBC News, the memos called for government contracts to be awarded to companies that had proven themselves good at helping borrowers instead of companies that were best at collecting debts. The memos were issued by the Obama administration due to a history of student loan companies with government contracts mistreating borrowers, Bloomberg reports. The nerve of this woman, expecting students to pay back money that they borrowed. Voted for Obama, but his decision on keeping Sallie Mae was stupid after all the fraud they perpetrated. Then they just changed their name to Navient to try to hide from the bad publicity. What do you learn by going to whichever college you want, regardless of cost, obtaining a degree that may or may not get you a job and expect someone else to pay for it. Once you graduate, should you expect someone else to set you up in a nice apartment, provide a car, tv, cell phone, clothes and food, etc., while you play video games and submit your resume on line touting your degree in safe spaces, expecting a $100,000 salary?